Here's my "Designer Purse" made from my late beloved's jeans. He loved wearing cargo type shorts, and I thought they would make a cute purse, and then have a reminder of him. I also used some of the leftover jeans to make a lined cosmetic bag. Isn't this teacup a beauty? A sweet blogging friend sent this to me, along with the Earl Grey Tea canister. Don't you love the rim of the teacup? I think I need a cup of Earl Grey to perk me up, after all that sewing! I cut out the pockets of the shorts, leaving enough fabric around to make a rectangle to the size that I wanted. You can see that there is a paint splatter on one of the pockets, for he was always helping someone paint or do any project that someone needed. I covered up the paint splatters with some flowers. Of course, I had to add some lace trim, for some added embellishment. I lined the inside with some cheery polka dot fabric, and made pockets for sunglasses, etc. Here's one of the sides, which I decorated with yo-yo flowers and used a zig zag stitch for the stems and leaves. On the sides of the purse, there were more paint splatters, and I covered those up with a tree and a sun. My "designer purse" is a sweet reminder of my hubby and I can carry a little bit of him with me. Of course, it was pouring when I wanted to write my post, therefore, I'm sharing some fairy garden pictures that I took of the McKinney Home and Garden Show that I attended over the weekend. Isn't this one darling, with the Ferris wheel at the base of a huge tree? 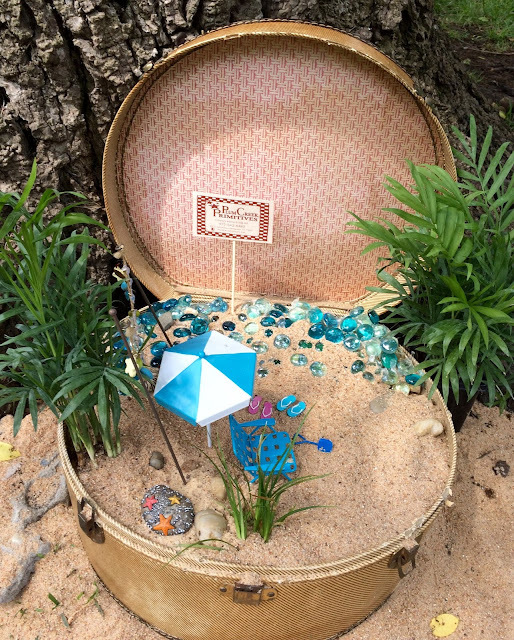 This cute one was done in a vintage hat box, and as you can see it's a beach setting. What fun! Kitty, your purse is so cute and it's sweet that it's from your late husband's jeans. I didn't get to go to the McKinney H&G Tour and I'm so bummed. I'm hoping that between you and Lisa, I'll see more pictures. The fairy gardens are darling! Happy Thoughts of Home Girl! What an adorable little purse! I love that you recycled shorts to make it and love the look the lace gives! So cute! Wow Kitty, I love this jeans bag you made using your late husbands jeans. Those are really cute fairy gardens and the tour must of been amazing. Hi Kitty, OH I just love your designer jean purse made from your beloved's jeans. What a darling idea!! Love the sweet little makeup bag too. Your teacup is gorgeous and earl grey is one of my favorites too. We've had the perfect rainy tea weather lately over the last couple days. Oh I just love the fairy garden ideas you shared from the garden tour. The beach theme in the vintage case is adorable. Love it. Thanks for sharing your fun and creativity!! Have a wonderful week sweet friend. Those are cute fairy garden ideas. What a sweet remembrance of your dear hubby. I love how you added the cute embellishments and added the pockets. So cute. I love this idea. I love the little beach fairy garden too. Such a great idea! It's still raining here and rained all weekend too. I hope we get some sunshine soon. Sweet Kitty, what a darling bag! And to think they are made from your dear husband's jeans....too precious. I know you will enjoy using this bag and in a sense having your hubby close to you. Thinking of you, lovely lady. Hugs and joy to you! You are so clever! 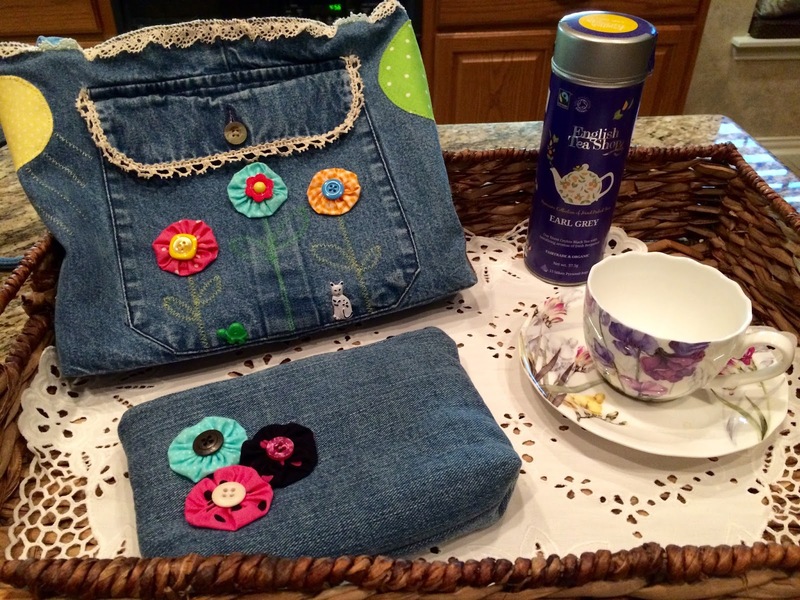 The recycled jeans purse and cosmetic bag are so very cute! What a darling way to use up the jeans and have him close to you. You are filled with wonderful ideas and I'm so happy you have shared them with us. The teacup is really pretty too. We have had only one day of sunshine in a very long time and it's cold too. Another June is slipping by and it's going to be a very short summer once again, I think. Ugh! Pity because we wait all year for this. Your trip to the Garden Show looked like fun too. Have a wonderful day. My, what a sweet way to keep your dear husband close. Your new purse and little bag are dear made from his shorts. You did a beautiful job on both, and the lining is so cheery. 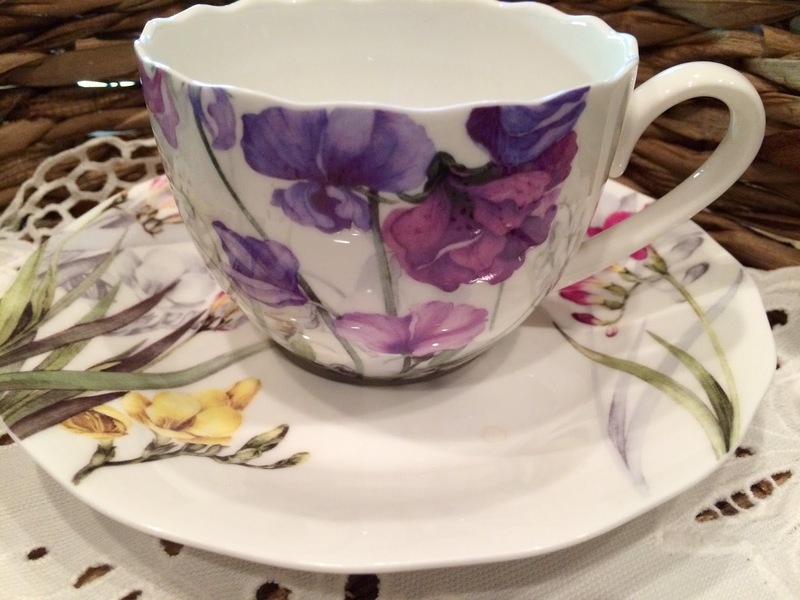 The tea cup is so pretty in bold watercolor flowers. Just lovely. What an adorable purse! I love it, including the pretty lace and fun yo-yo flowers. What a special way to use his shorts, and keep something that was his. Love the lining, too. The little fairy gardens are sweet, too; love the ferris wheel. This is a great idea Kitty for recycling. The purse and cosmetic bag are so cute and a way to keep your dear husband close. Love the lace and the flowers you added. The rim of the cup is unusual and such a pretty pattern. 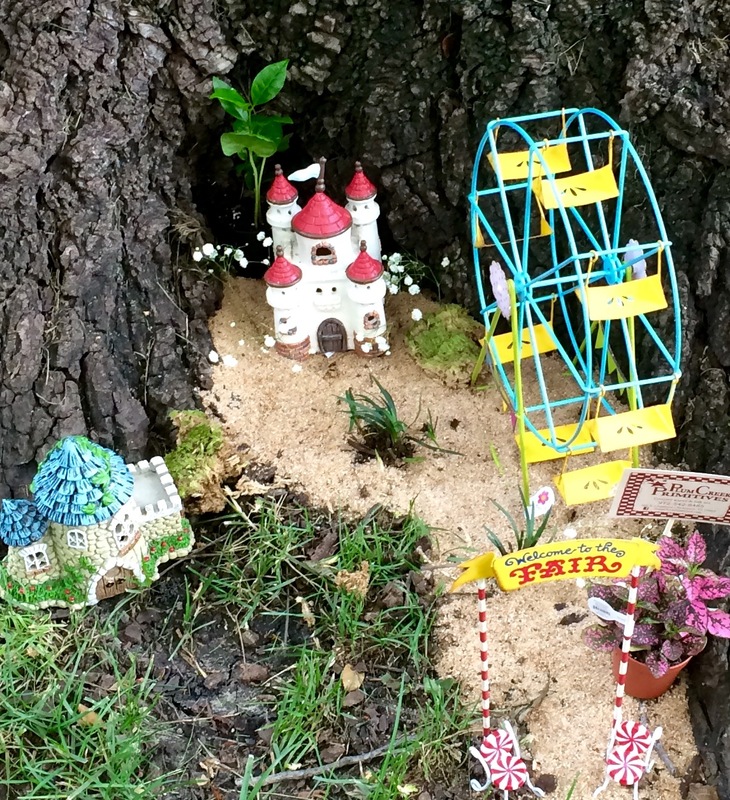 Fairy gardens are so sweet, I do enjoy seeing them and I play a little at making one. Sure hope you have a lovely week………. 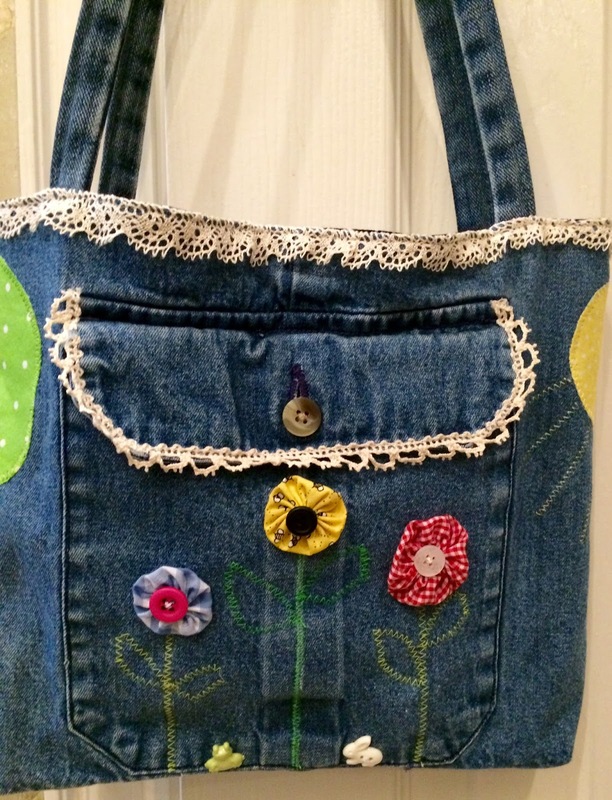 I loved how you used your husband's old jeans to make this super cute purse! I'm also crushing on your pretty new teacup. I've never met a purple teacup that I didn't like! The fairy gardens are also charming. I was hoping to create a fairy garden this summer, but Bernideen has gotten me hooked on birdhouses. HA! Very creative to make a purse and cosmetic case from your late hubby's jeans. The teacup is gorgeous and I'll bet your Earl Grey tea from it was wonderful. My fairy gardens can't have soil or sand because the squirrels dig in them but if they weren't around I'd love to create a beach scene. You have to know that I have been waiting for this post! This little bag is so cute and just the loveliest reminder of your husband. (paint spot and all) The embellishments are perfect and I like the idea of using stitching for stems! 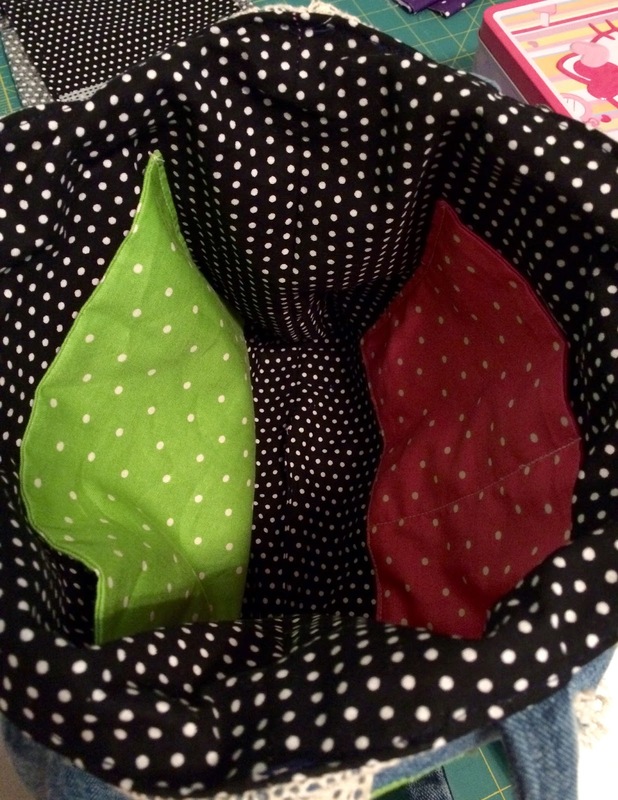 The inside is lined with such bright, cheery fabrics! Your tea cup with the scalloped edge is very pretty! I love Earl Grey too and in fact I am drinking some as we "speak!" I love the fairy gardens too. I hoped to find time to make one of my own but so far it hasn't fit into my schedule. Have a lovely week Kitty! And OH what a special purse it is! I.LOVE.IT! Such a treasure to carry with you...am wild about that gorgeous teacup too. Thanks for sharing!! Kitty your purse is so adorable! I think you need to open an etsy shop! PS Didn't you love the garden tour? I was so busy being awed I forgot to take a lot of photos! Oh how lovely to stitch a 'one-of-a-kind' purse from your husband's denim shorts; it is lovely. I am in love with your teacup. It is such a pretty design. Such a great idea Kitty, and it turned out so cute! Thank you again for my lovely soap-it smells so very good. What a great purse and cosmetic bag. You are creative to think of using your husbands jeans. Sweet memories to carry with you. This is so cute! What a great idea. Thanks for sharing. Also what a sweet reminder. Kitty, that is a really cute purse and cosmetic bag. What a beautiful way to daily feel your late husband's presence with you. Earl Grey is my favorite tea. I'll take a cup any time of day, after sewing or not...in my case not, as I don't sew. Love the scalloped edges of the teacup. So feminine. Your purse is really cute. I love the fairy gardens too. I am sure was a lot of fun to attend. I am still working on my garden a lot but now it is VERY hot so only in the mornings and evenings. Loved your tea cup too! That was a lovely gift. Thanks for sharing and linking. Ha! What a cute idea!! The little bag is adorable and I'm in love with the fairy beach in the hat box. Your purse is adorable, and how special and sweet...I love the fairy gardens too, it seems like they are popping up everywhere these days, each as cute and the next!! Dear Kitty, the purse is adorable and I love that it's such a sweet reminder of your dear hubby! The embellishments are just darling! Cute fairy gardens too. Thanks for sharing with SYC. Oh my gosh Kitty - I love Love that purse, especially the detail with the lace and flowers. Simply perfect and what a neat way to carry your hubby with you. Loving those fairy gardens too - I'm hoping one day I'll slow down and create one too. What a cute little purse you created and a sweet way to remember your husband. I really was touched by this post..guess I'm just sentimental today. How very sweet Kitty. I love your idea and your work is wonderful, as is everything you do. Hugs to you. Kitty, I can't believe I forgot to comment on this post earlier in the week. Crazy work week! This is a wonderful way to carry Rich with you, and I know he must be smiling at this project. I LOVE the purse, so pretty, and how special the sentiment behind it. 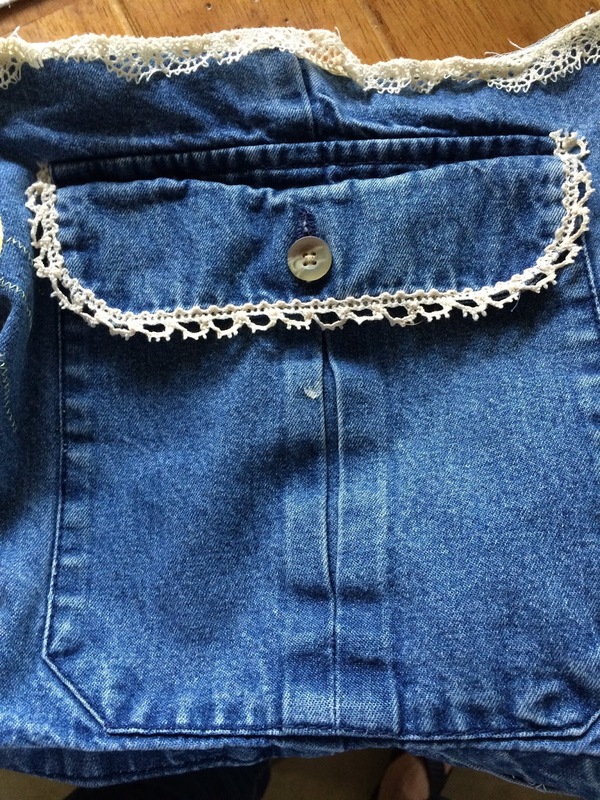 Your recycled jeans purse is a wonderful. A swell idea to remember a loved one. 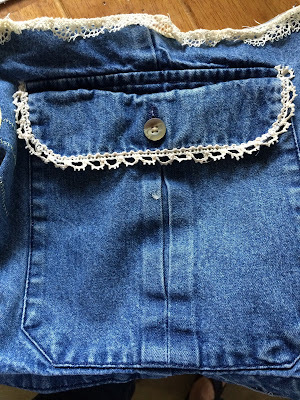 The clever embellishments certainly add femininity to a pair of jeans. The scalloped rim on the iris cup is unique and attractive. A fairy garden is on my wish list, but the items are expensive. Perhaps I should make my own. Your purse is beautiful! Love all the detail. You are an excellent seamstress, Kitty. Such a lovely keepsake. Hi Kitty! I love how creative you are with treasured ways to keep hubby's memories with you. Thank you for sharing and linking up at Dishing It & Digging It!